Let’s leave the Saints’ bounty issue to the commissioner, and focus on a personnel question that has not received a lot of attention in recent weeks. Because now, with free agency here, it’s front and center. Marques Colston or Carl Nicks? Both are free agents. Assuming, I trust correctly, that New Orleans will not re-sign both, which of the two is more valuable to the Saints offense? We are clearly programmed to believe, in this era of passing, that a highly productive wide receiver is more important to a record-setting pass offense than a left guard. That’s the instantaneous reaction. Is it the right response? A closer examination of the Saints is demanded to properly address the question. The Saints are a multiple personnel and formation offense that utilizes different players in different positions throughout the game. It all has to do with the principles of receiver distribution and location. In simple terms, receiver distribution is the number of receivers to each side of the formation. When you hear 3×1 set, it means three receivers to one side, and one receiver to the other side. Receiver location refers to who those receivers are. If the three receivers to one side are all wide receivers, the defense might deploy one way. If those three receivers are Colston, TE Jimmy Graham and RB Darren Sproles, they might align another way. That’s the impact of receiver location. I have had defensive coordinators tell me they do not attempt to match up to the Saints’ diverse receiver location groupings because it places too much of a mental strain on their defenders. Instead, they simply match up to the distribution, i.e., the number of receivers to each side. Drew Brees knows this before the snap of the ball, and it allows him more often than not to locate his most favorable matchup in the pre-snap phase. It’s a beautifully conceptualized passing paradigm executed to its fullest by a quarterback with an uncanny ability to control the game from the line of scrimmage. What is Colston’s role in this offense? He predominantly aligns inside the numbers as a slot receiver, what we call minus splits. He might be just outside the offensive tackle in a tight slot, or he might be further removed in a wider slot alignment. The essential point is Colston primarily works the middle of the field from minus splits, almost always matched on combinations of linebackers, safeties and nickel or dime corners. He is not an outside receiver who lines up wide and runs isolation one-on-one routes versus starting corners. In fact, he will not be effective doing that. He is not a perimeter receiver. Make no mistake – Colston is very good at what he does. However, he is not an elite NFL wide receiver in the class of Andre Johnson, Calvin Johnson or Larry Fitzgerald. He’s a scheme fit in a precisely orchestrated pass offense that is the best in the NFL, driven by the most accurate passer in the league. Let’s turn our attention to Nicks. He also must be placed in the context of the Saints’ passing game, and Brees in particular. Nicks was a college left tackle who transitioned to left guard with the Saints, and is arguably the best at his position in the league. Brees is a 6-foot-0 quarterback with great timing and anticipation, and outstanding pocket movement. As mentioned earlier, he is without peer in the pre-snap phase, recognizing pressures and coverages, setting protections and dictating matchups with shifts and motions. Brees’ overall quarterback attributes have always been the reason for his low sack totals. In fact, he has compensated for and camouflaged average offensive tackle play. Those who believe the Saints have had outstanding tackles have it wrong. Brees, like Peyton Manning for years in Indianapolis, has minimized a weakness. On the other hand, Nicks and right guard Jahri Evans have been excellent interior linemen, more often than not providing the shorter Brees with functional space and clear sight lines to deliver the football. In the NFL, almost anyone can be replaced. 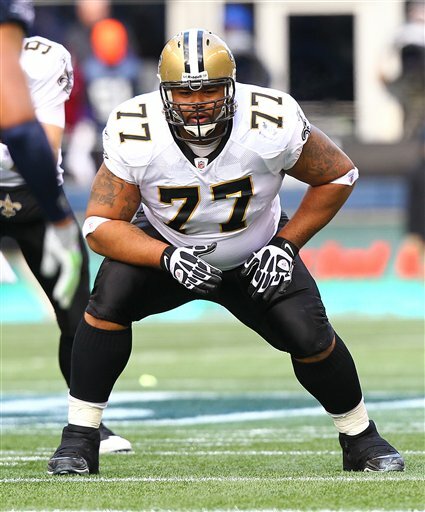 My sense, within the structure of the Saints offense, is that it would be more difficult to find a better player than Nicks at left guard. Colston, as productive as he has been, is essentially a slot receiver whose outstanding numbers reflect his role in a pass-first offense that compiles yards and points fueled by an elite quarterback. In addition, this year’s draft features a number of receivers who could fill the Colston role in the Saints offense, and those receivers will likely be available in the second and third rounds. One could also make the case that teammate Robert Meachem, another free agent, will travel better than Colston. He can win on the outside, and has vertical big-play ability. Between the upcoming draft and the imminent free-agency period, March is at the center of the NFL’s player evaluation season. How the Saints allocate their free-agency dollars during this season might provide great insight into which pieces of their offensive puzzle they consider the more valuable. EDITOR’S NOTE: When NFL Players ranked the Top 100 players in the game for last year’s NFL Network countdown, both Carl Nicks and Marques Colston made the list. Nicks came in at #55. To see where Colston rated, check out the video below. And to find out if the players still consider these two Saints among the NFL’s best this year, stay tuned to NFL Network in the months ahead.